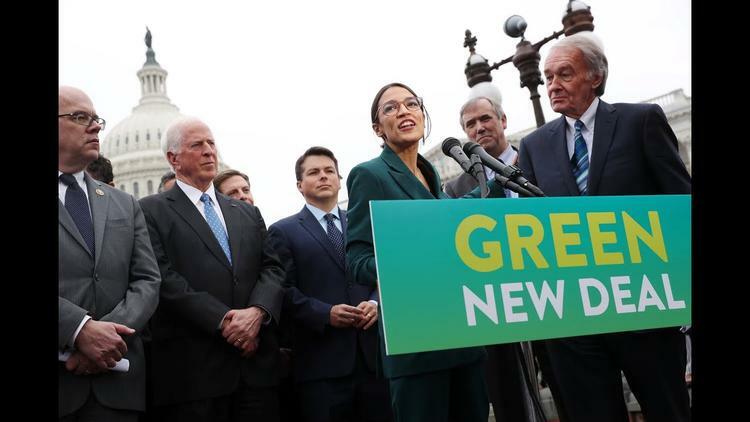 The Age of Environmental Breakdown: We need the Green New Deal Now! That is, we are not understanding our planetary climate emergency and not swinging into action nearly fast enough given the epochal severity of the catastrophe. Half of the carbon being flooded into the atmosphere is being produced by the richest 10 percent of the world. The authors insist we need a rapid, thorough and transformational response, and that to be effective it most come above all in the industrialized nations. The earth’s natural systems are being destabilized jointly and faster than ever during the 200,000 years of human existence. Actually, with regard to burning coal, gas and oil to raise the carbon dioxide level in the atmosphere from 270 parts per million to 410 ppm of CO2 just since 1750, we accomplished a change in only 268 years that in past eras has taken tens of thousands of years. 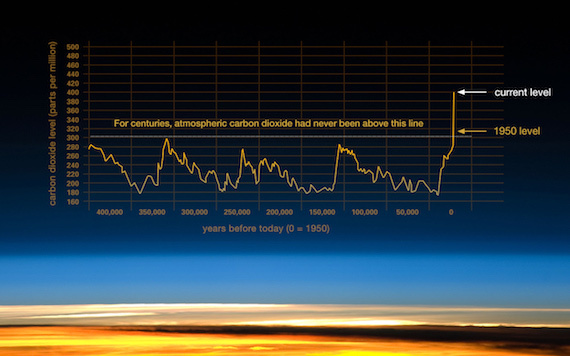 For instance, in this chart we were at 180 ppm of CO2 some 340,000 years ago, and by about 310,000 years ago the earth had gone up to about 300 ppm. So that doubling took 30,000 years. It was caused by a lot of volcanoes erupting frantically over thousands and thousands of years. But then the earth quietened down and the CO2 plummeted back down to 180 ppm by 250,000 years ago. So just to underline this, we human beings have done *more* in 268 years to put CO2 in the atmosphere than all the volcanoes in the world going off regularly used to be able to do in 30,000 years. What Exxon-Mobil and Saudi Arabia don’t want you to notice is that spike on the chart at the far right. That’s us, folks. This amount of CO2 hasn’t been seen by the earth during the past 400,000 years. We Homo Sapiens only evolved about 200,000 years ago, so we’ve set it up to be way hotter than it has ever been all the time we’ve existed. We know we’ve been a successful species during the low-carbon era. We don’t know whether we can adapt to this new world we are rapidly creating. Increased carbon dioxide traps the heat of the sun on earth and doesn’t allow it to radiate back into space at the rate it used to. This Frankenstein of a climate transformation has produced this effect, IPPR says: “The 20 warmest years since records began in 1850 have been in the past 22 years, with the past four years the warmest ever recorded. And note that we’re only at the beginning. We have been putting 38.2 billion metric tons of carbon dioxide up into the atmosphere every year. Seriously, all, why would you do that? Some proportion of it will be up there for 100,000 years. Some of it will be absorbed by the salt oceans and turn them acidic, killing off half of marine life. But the average temperature of the surface of the earth does not yet reflect all those heat-trapping gases already up in the atmosphere. The oceans are huge and deep and cold, and will only very gradually warm up. The two poles and the Himalayas still have a lot of surface ice, which lowers the global average. But over the next few hundred years these brakes on rapid heating will go out and the disruption will accelerate. It is already accelerating in our own lifetimes faster than any scientists imagined just a couple of decades ago. Climate transformation is only one cause, but the various things we humans are doing are not good for children and other living things. There are two kinds of animals, those with backbones and those without. Human beings are vertebrates, having a spine. So are hyenas and orangutans. Since we are vertebrates, whatever killed off 40% of our kind may be, like, bad for us, too. The diversity of life is a powerful genetic resource. As genetics advances, some key human diseases may end up being cured because of research on other vertebrates. But our grandchildren may not have this precious reservoir at their disposal. They won’t be able to see tigers and elephants. By the way, the invertebrates are doing worse. Loss of habitat to cities and the systematic and long term use of powerful toxic pesticides have meant that in some countries, 70% of insects have been killed in just the past 50 years. A third of insect species are threatened with extinction, and given the rate that we are killing off the insects (who fertilize the plants that produce our food), there may be none left a century from now. That would lead to an apocalyptic die-off of human beings, as well. (This isn’t fated, it is our choice. We just have to ban the problem pesticides). Then there is that issue of food. Industrialized agriculture has made it possible for human populations to mushroom enormously. I was born in 1952, when the global human population was a little over 2.5 billion. It is now 7.7 billion. Seriously, folks, that is ridiculous. You need to take some cold showers or something. More people have been born during my lifetime than during the whole 4.5-billion-year history of the earth. Feeding the extra 5 billion mouths that have come into existence in the past 66 years has only been possible because of advances in farming. But we may be facing limits there of an alarming sort. And the human-made climate crisis will take arable land off the table through sea level rise and desertification. The Egyptian Delta isn’t going to be there after a while, for instance, and it is a major grain-producing area. In other words, we desperately need the Green New Deal, and we need it, like, yesterday.